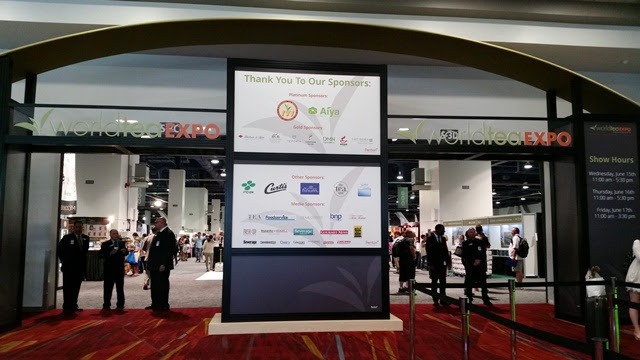 The 2016 World Tea Expo took place on June 15th through 17th, returning to its roots in Las Vegas, Nevada. 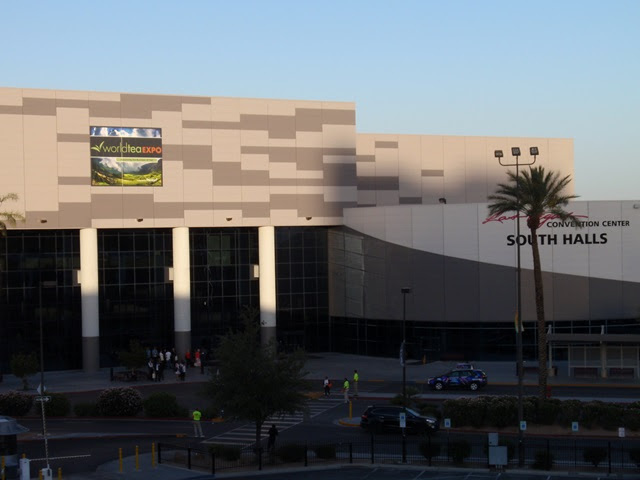 Day One was a whirlwind of special events and workshops. I arrived in Las Vegas late in the morning and had just enough time to pick up my press pass and make a quick circuit of the Exhibit Hall before heading into my first event of the day. The panel was moderated by Darlene Meyers-Perry (The Tea Enthusiast's Scrapbook). The central topic was reviewing "bad" tea. Having a review policy and communicating with the vendor seemed to be standard procedure for most. 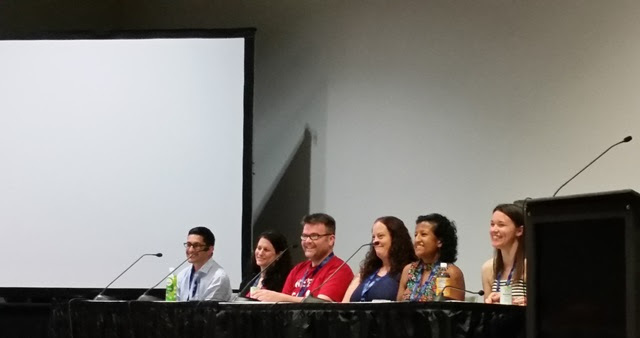 I had to leave a little early to attend a presentation, though I did get to see some great interaction between the audience and the panel. I arrived at the conclusion to Thomas Shu's presentation which offered solutions and inspiration for preparing and presenting tea for events of all sizes and formalities. 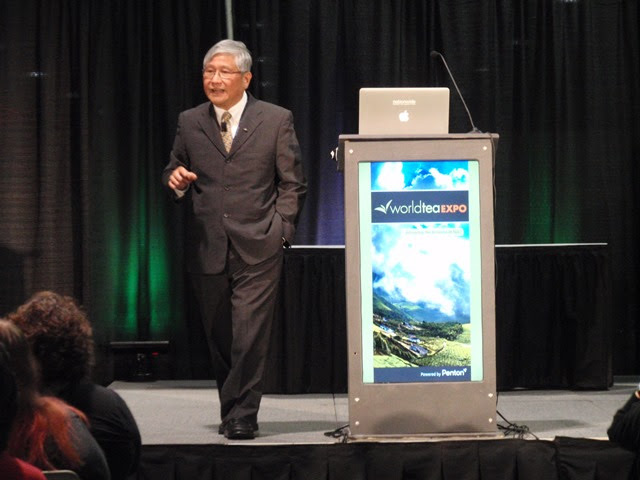 I came away with some great ideas from last year's presentation and I was happy to see a new audience being inspired. This special presentation was made possible by JETRO (Japan External Trade Organization). 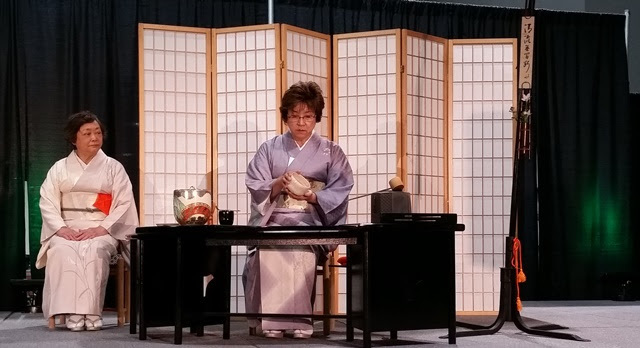 Akiko, a green tea instructor and tea ambassador, described the different types of Japanese tea, steeping methods, processing, and steaming. Meanwhile, the audience was treated to samples of cold-brew sencha and gyokuro. The tea ceremony was performed by members of Omotesenke Domonkai, a Southern California-based branch of the second largest school of tea ceremony in Japan. The teishu (host) was Sachiko Okazoe and the hantou (assistant) was Kayoko Kawasaki. Narration was provided by Marie Tanaka. 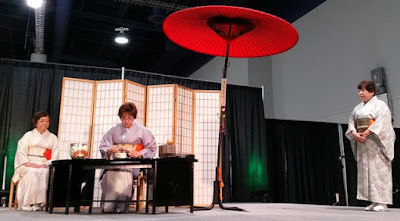 The style was ryurei which utilizes tables and chairs and a nodategasa (large red umbrella) signified an outdoor setting. The tanzaku scroll translates to "the continuous flow of water in the stream". Tea was prepared for five guests from the audience, accompanied by an explanation of the procedure and descriptions of each chawan (tea bowl) style and motif, as well as tea implements including the mizusashi (fresh water container), natsume (tea container), and chashaku (tea scoop) which was given the poetic name "Matsuri" (festival) for its resemblance to the poles used to carry the mikoshi (portable shrine) at Japanese festivals. During a special presentation by Yiyang Municipal City, Hunan Province, Anhua County, Yiyang, Hunan Province, and Hunan Provincial Tea Cooperation Co. Ltd, the audience learned about the origins of heicha (dark tea), how it is processed, and the significant role Yiyang holds in dark tea manufacturing. 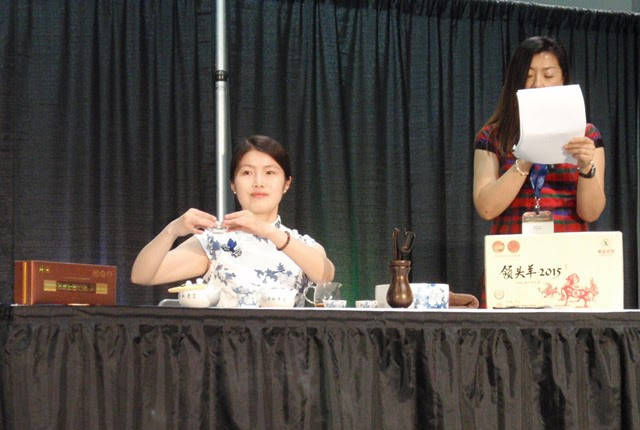 Members of the audience were presented with freshly prepared dark tea as well as a bag filled with tea samples. 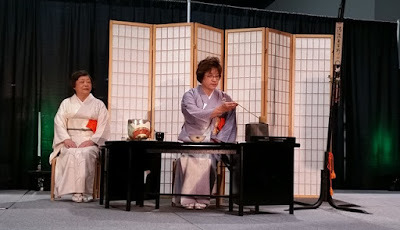 The presentation concluded with a demonstration of a beautifully stylized Gongfu Cha preparation of heicha, accompanied by an explanation of each step for tea appreciation. My first stop in the Exhibit Halls was Nagi Kyoto Japan where I enjoyed the taste of freshly ground matcha as well as a sample of their TeaCoffee, a blend of coffee and Uji-grown tea. The result is intriguing, with the taste of coffee being prominent at first and the tea coming in at the finish. 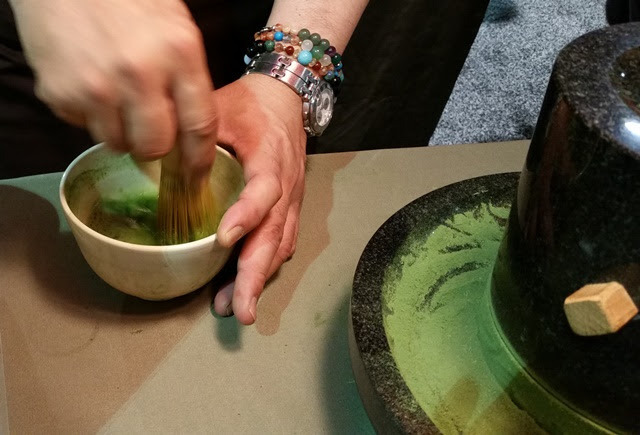 Mana USA is a family-run business partnered with Mana Organics to direct-source organic teas from Assam with a focus on sustainability. 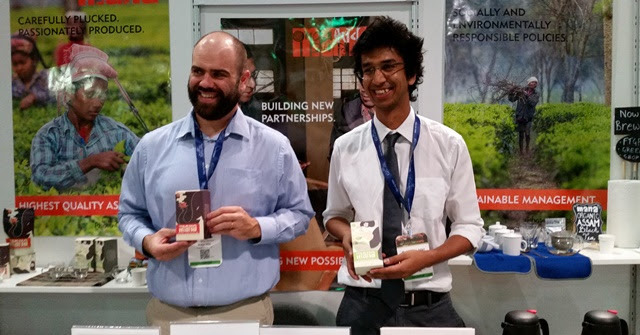 It was a pleasure to meet the husband and brother of founder Avantika Jalan, a 4th generation tea grower. 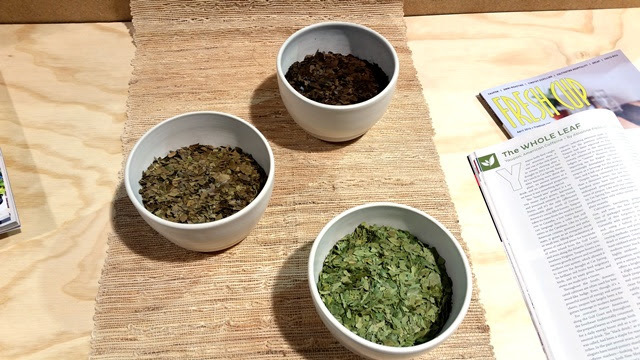 Cat Spring Tea is reintroducing North America's only native source of caffeine. They are sustainably producing yaupon, an energizing tisane heavy in antioxidants that has some relation to yerba mate and guayusa. It was once consumed by Native Americans and had even been exported to Europe until interest waned with the increased import and consumption of tea. Joseph Wesley is a single-estate direct-source tea importer based in Detroit. I've been hearing great things from other tea bloggers so I'm glad I had to opportunity to meet the man behind the name. 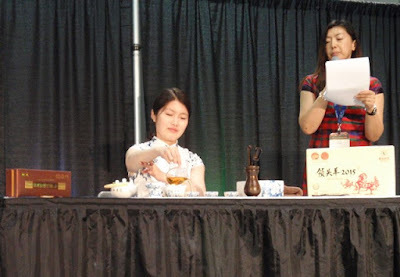 In addition to offering a line of teas for the retail market and a culinary line for the wholesale market, Joseph Wesley is an author whose first book, The Art and Craft of Tea, was released in 2015 and has garnered glowing reviews. 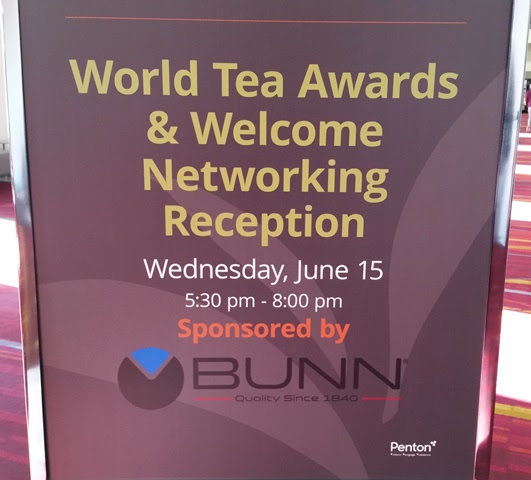 Day One at World Tea Expo concluded with the Welcome Reception which was open to all attendees this year. 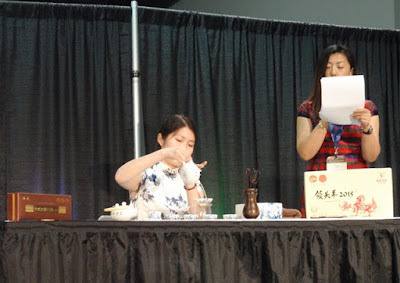 I had the opportunity to talk with some wonderful people, enjoy a light meal, and learn more about some of the biggest influences in the modern tea industry. The highlight was a particularly moving tribute to Devan Shah presented by James Norwood Pratt.